The Complete Angler Recognition award was established by the BSA National Fishing Task Force in October, 2014 for the purpose of providing and recognizing a well-rounded youth within the Boy Scouts of America. 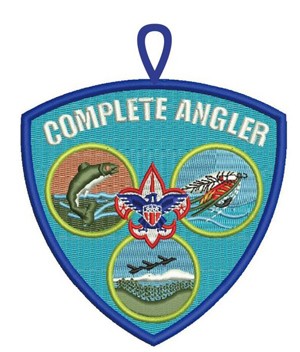 Scouts who have earned the three Fishing related merit Badges - Fishing, Fly Fishing, and Fish & Wildlife Management - can be recognized as a BSA Complete Angler. The patch shown above, is produced and distributed by BSA Supply and should be available in your Scout Shop or Trading Post.